This morning’s GDP data reveal that growth in the second quarter was a little slower than we thought—revised down to 1% from 1.3%. With 0.4% in the first quarter, that means growth in the first half of the year amounts to about 0.7%. Recall that it takes growth at trend—about 2.5%–to just keep unemployment from rising, and you will understand my incessant clamoring for someone to do something. Like FAST!, for example. There’s another reason for the urgency. You can also see in these data the resurgence of income and wealth inequality. There’s quite a lag to the inequality data, so no one knows what the trends in income or wealth disparities look like post-2008, e.g. What with high unemployment and weak middle-class earnings, along with solid corporate profits, one assumes that after taking a hit in the downturn, wealth accumulation is “back on track” as it were. That’s certainly been the pattern of the last two recessions/recoveries. Today’s data provides some evidence in support of that expectation. The first figure below shows the recent trends, up through last quarter, in corporate profits and workers’ compensation as a share of GDP. 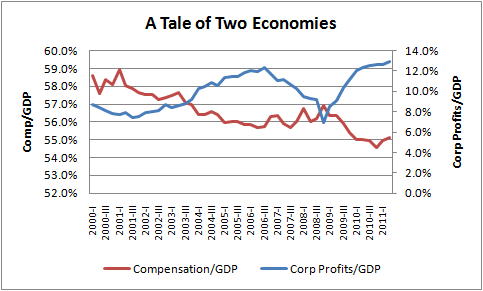 As you can see, corporate profits have not only recovered their pre-recession highs, they’ve surpassed it. And compensation as a share of the economy is far lower. You can also compare how different these patterns look compared to last recession in 2001, when the income shifts were not nearly so sharp. It’s truly a picture of two very different economies, one for those who depend on their paychecks and one for those who depend on their portfolios. And yes, there’s an intersection of those two groups—corp profits do not solely enrich the haves—but that’s more of nuance. The key point remains that even at less than one percent growth, stagnant real wages, and a sharp decline in the compensation share, corporate profits have more than recovered. Clearly, these corporations are selling into emerging markets, tapping productivity gains without hiring, and trading financial instruments. Nothing inherently wrong with that, unless it’s the only thing that going right in this economy. Which it kinda is. A few weeks ago I discussed the deeply corrosive impact of such extreme wealth concentration, as it shuts down new ideas that can correct this destructive trend. And just last night, I worried that we’re losing our ability to self-correct. The image of the above figure should be viewed as a big, scary dragon of sorts, as in the next figure. And we must stop its flight before it devours what’s great about America. Source: BEA, with a little help from me. 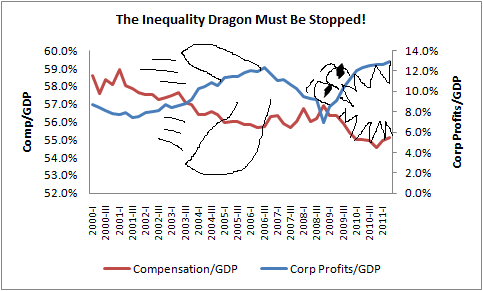 Share the post "A Tale of Two Economies and the Inequality Dragon"
9 comments in reply to "A Tale of Two Economies and the Inequality Dragon"
Corporations sit on those profits when regulators make investing it uncertain. Much of the corporate profit currently held comes from overseas local domestic markets, America is not producing profits. If pay were to rise it would be in China. You really believe that? In a perfect Keynesian model your analysis would be true if short term profits and bonuses collected by the few in control were not the agenda. Case in point, GE maximizes profit by minimizing expenses at all costs in the short term (out-sourcing to enhance bargaining power = 20%+ reduction in US wages paid in the last decade)while enjoying massive tax and subsidies at the public trough they are helping to destroy in the long term. There’s been lots of criticism for the failure of the Bush administration to take advantage of the large budget surpluses they inherited and put the country in a better position to handle an economic downturn (see Ron Suskind’s book on Paul O’Neil – for some great insight into how close we actually came to getting this right & who stood in the way). But no one wants to discuss the fact that most all of the money is still there – its been saved by the wealthy and only added to both the national debt & the wealth concentration problems simultaneously. Who gains by our refusal to discuss this? Certainly not the “majority” of Americans. We need to find a way to tie the acquisition and maintenance of enormous amounts of wealth to the success of our country as whole and not let it continue unimpeded to the detriment of the country. Buffet is simply trying to preempt the backlash that’s bound to occur when the American public finally figures out the true magnitude and implications of what’s gone on here. Because it’s the subject that must not be discussed. Lest it raise the demon of popular or political revolt. This outcome was inevitable. But the thirst for greater profit and corporate growth demanded that more and more jobs be outsourced or eliminated altogether. It is still happening today in a bizarre cycle of economic immolation. Listen to the rhetoric coming from Washington DC. We must cut spending and govt (translation: thousands of more jobs eliminated), cut social supports, etc. To save the economy! It’s like a crazed anorexic, no longer satisfied with vomiting to lose weight, who begins lopping off extremities to satisfy a neurosis that is insatiable, irrational and predictably self destructive. I always knew you were an artist of economics, but I never knew how economical an artist you were. Beautiful graphic! PS: Good points, too, by the way. I am now firmly of the position that EVERY chart, grpah, or plot should be illustrated into a mythical creature. I hope my dissertation committee agrees. How far back do these data sets extend? I’d love to see a long-term graph. Ezra Klein featured this on “Last Word…” tonight, over a year after it appears and there’s only 8 comments. I think the “Dragon” should be emblazened on a flag and flown outside the Capitol Building.